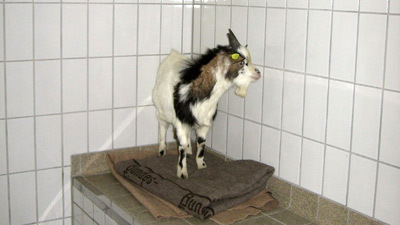 A goat is behind bars in a German police cell after he was ‘arrested’ for disrupting traffic. Billy the kid was caught by cops in Bremen after it blocked traffic by standing in the middle of a road crossing. 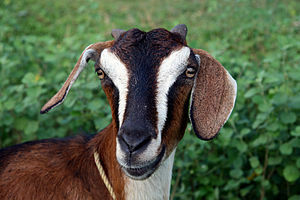 The goat then led cops and locals on a chase across town when officers – called in by drivers – tried to catch it. It was eventually caught by police after several patrol cars had to be called in to help. via Ananova – Billy the Kid behind bars. 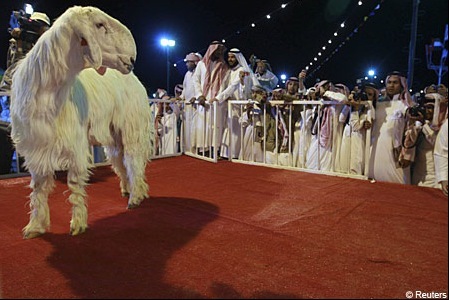 An enthusiastic crowd take photographs of a Maaz Al Shami Damascene goat, which won the coveted ‘Most Beautiful Goat’ title, during the Mazayen al-Maaz competition in Riyadh, Saudi Arabia, on Friday. A Bulgarian farmer has swapped his wife for a goat – because she couldn’t give him kids. Stoil Panayotov exchanged his third wife with Elena the eight-year-old goat at a livestock market, reports the Daily Telegraph.